Quick Details: Material	Plastic, polyester,PP, rubber,steel Length&Capacity	1.5m--5m 1000kg-4000kg. Color	Red, white, green, yellow, blue, and other colors. Packing	Blister packing, zipper hand bag, etc. Or as your requirment. 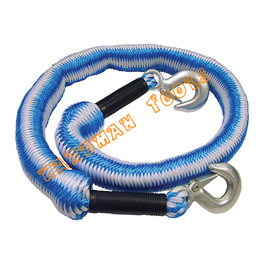 Product Features	easy handling; Abrasion resistance, high strength, high stretch, excellent shock absorbing properties. Application	Ideal for towing vehicles, pulling equipment, and moving debris. Delivery Time	Within 30 days after confirming deposit, or as your request. Samples	If you need, we can provide samples for test first.